Learn Chinese tones from the comfort of your keyboard with YDK – Chinese Tonal Keyboard. YDK, a huge bite of Chinese, where tones and characters are digested together. There are more than 50,000 Chinese learners in US colleges alone and the number reaches millions globally (US-China Institute). The trickiest part of speaking is mastering the tones. Currently, there are very limited learning resources available to intermediate Chinese learners who wish to practice and solidify their pronunciation. Primarily, our competition comes from other keyboard apps and general Chinese learning applications. Currently, Chinese learners are forced to settle for keyboards designed for native speakers. Although these keyboards have advanced predictive features, this functionality is underutilized by learners who have rather limited vocabularies. The stand-alone language learning apps, on the other hand, are for pure learning purposes and do not integrate well into the regular user workflow. 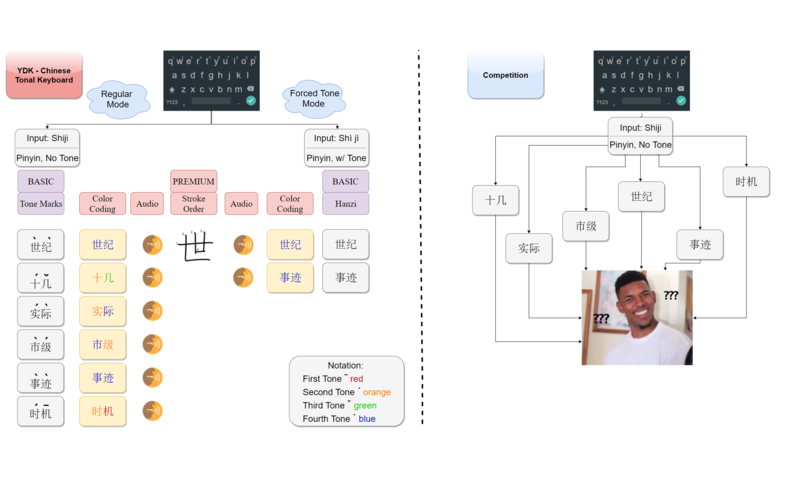 We provide a platform for the growing number of intermediate and above Chinese learners by incorporating the tonal feature of the Chinese language into keyboard design. Learners can practice tones while utilizing their keyboards in a typical manner such as texting and Googling. In order to reach the maximum the amount of users, we are planning to offer basic version of our keyboard for free. Both the basic and the premium versions will include two input modes: Forced Tone Mode and Regular Mode. In Regular Mode, the keyboard is used in a similar fashion to currently available keyboards.Compared to other keyboards, our app displays characters together with their tone marks, so that the difference between each pronunciation is clearly indicated. In Premium mode, each character is color coded with the corresponding tone to help with memorization visually. Additionally, user may click on the characters to hear the pronunciation, recorded by a native speaker. Character stroke order is also provided. Premium mode will cost $0.99. In Forced Tone input mode user has to input pinyin (standard phonetic representation) and correct tones. User will then select from most frequent corresponding characters. By forcing the user to input the tones our keyboard helps users master them. The same premium features are available in Forced Tone input mode as well.